Every square inch of shelf space is usable in this mitered end cabinet. Remember when tall end cabinets were hard to access or were shallow-shelved and just used to hold knick-knacks and other various “stuff”? Elmwood has recently introduced the tall square 90-degree mitered door end cabinet. No more reaching to the back of a deep cabinet. Full access on every square inch of shelving with its 170-degree hinge. The top door opens independently of bottom door. Opens on the right or left. It’s slick and beautiful. 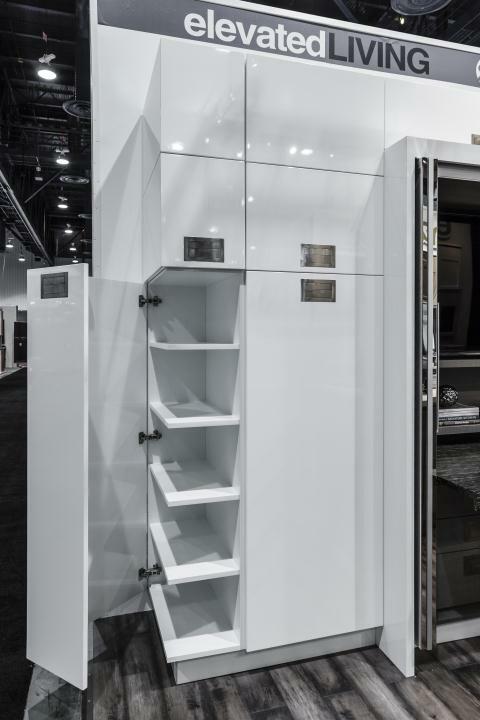 That’s not to say that our other suppliers, including Elmwood, don’t have fine quality cabinet systems with fully-accessible pull-out shelves and pantry systems. But this new one has us totally wowed with its contemporary European styling.